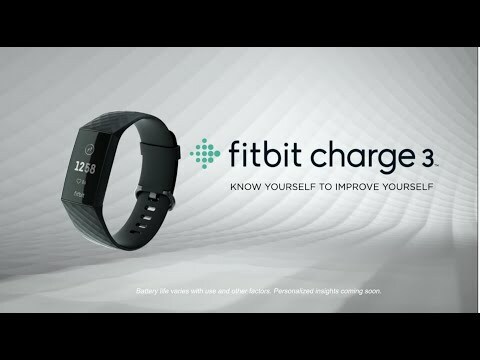 Know Yourself on a Whole New LevelTake action with Fitbit Charge 3, the innovative health and fitness tracker bursting with advanced features to improve your understanding of your own health and body. This smart wireless health band uses 24/7 heart rate and personalised data to keep you updated with real-time insights to reveal more about yourself. Pay on-the-go effortlessly with a specially designed NFC chip that allows contactless payments with Fitbit Pay™. Fitbit Charge 3 is a Special Edition touchscreen fitness wristband, designed with breathable woven material in Lavender made with durable Rose-Gold aluminium detail. If you fancy a sportier look switch to the black classic band * both come with small and large sizes. Use this guide for more information to find the right size for you, both small and large sizes are included in the box. shop smart with the charge 3 With the Fitbit Charge 3 you can load your favourite cards to your Wallet in the Fitbit app, then use Charge 3 to make easy, secure payments on-the-go. * Only available on special editions. Fitbit Charge 3 Fitness Activity Tracker, Special Ed, Lavender Woven, Fitbit Pay, Water Resistant, 24/7 Heart Rate is rated 4.8 out of 5 by 6. Rated 5 out of 5 by Ashbymorf from Nice and stylish Easy to set up and use, although some of the information is a little small on the screen, need to put my glasses on to see it. Like the fact that it comes with different size straps and a black one, great for exercise if you get sweaty. Easy to see and understand the info on my iPhone. Rated 5 out of 5 by Judyjude from Love this Fitbit! The Fitbit was so easy to set up and use. It also looks good! Rated 5 out of 5 by Jojo9876 from Fitbit Charge 3 Great product, very happy and the Fitbit app is easy to use. Use it for tracking food, weight, water, steps, exercise, calories, active minutes, heart rate, miles covered, sleep plus stages and more. The only time I take it off is to charge it and lasts about a week on a full charge. Also bought a different strap to wear for going out so it looks like a piece of jewellery and not just a fitness tracker. Rated 4 out of 5 by MissR from Great product - shame the contactless payment is useless A good improvement on the Charge 2, with touch screen and much better strap mechanism meaning it’s easier to swap straps. I took away one star as the advertised contactless payment doesn’t support cards from any of the major UK banks. Rated 5 out of 5 by Bubblesmirror from Great product I have previously owned the charge 2 and was unsure the charge 3 would be any better but im so glad i upgraded! I find it much easier to use with more features.